Because the calculated Fs for 2010-2012 relative to most candidate reference points, except FMED and F50% (which the Albacore Working Groups considers to be poor choices as reference points for this stock), are below 1.0, North Pacific Albacore (NPALB) is not experiencing overfishing. 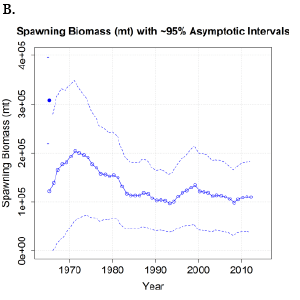 The 2014 assessment estimated that spawning biomass in 2012 (110,101 t) was more than two times greater than the 20%SSBCURRENT F=0 limit reference point established by the WCPFC, which means that the stock is not in an overfished state. Thus, the ISC concludes that overfishing is not occurring and that the stock is not in an overfished state (Figure 1, Figure 2, and Figure 3). Figure 1. Estimated total age-1+ biomass (A), female spawning biomass (B), and age-0 recruitment (C) of NPALB. 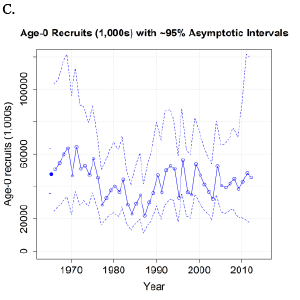 The open circles represent the maximum likelihood estimates of each quantity and the dashed lines in the SSB (B) and recruitment (C) plots are the 95% asymptotic intervals of the estimates (± 2 standard deviations) in lognormal (SSB – B) and arithmetic (recruitment – C) space. 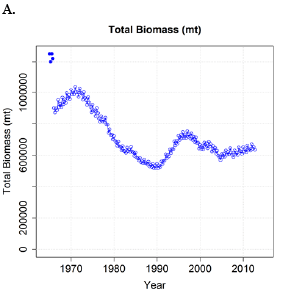 Since the assessment model represents time on a quarterly basis, there are four estimates of total biomass (A) for each year, but only one annual estimate of spawning biomass (B) and recruitment (C). Figure 2. Alternative Kobe plots showing NPALB stock status based on Fcurrent (F2010-2012) relative to MSY-based reference points (top left) and MSY proxies consisting of SPR-based fishing intensity reference points (F10%-50%) for the 2014 base case model. Grey dots are the terminal year (2012) of the assessment. NC10 chose SB20% as the limit reference point. 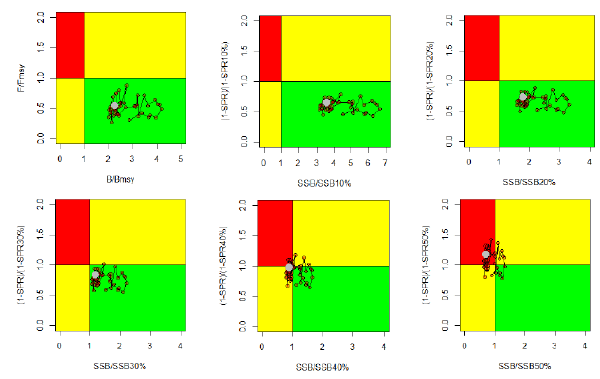 These plots are presented for illustrative purposes, because a target reference point has not been chosen. Figure 3. 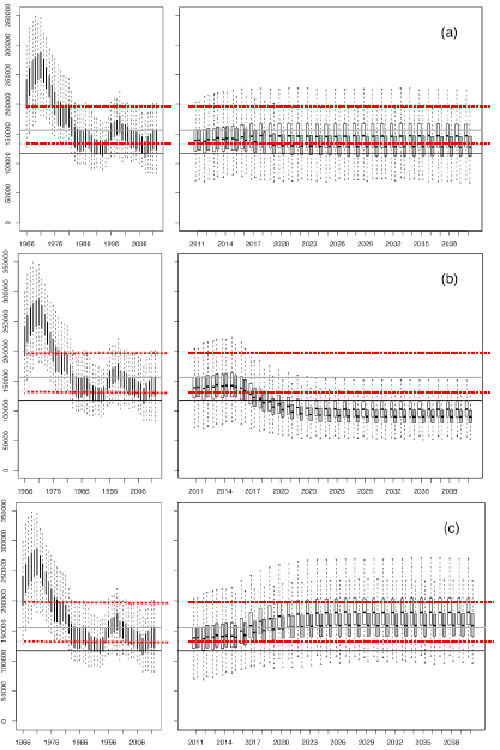 Historical (left) and future trajectories of NPALB female spawning biomass (SSB) based on to two constant harvest scenarios (F2002-2004 - gray boxplot; F2010-2012 - white boxplot) for average historical recruitment (a), low historical recruitment (b) and high historical recruitment (c) scenarios. The solid gray and red dashed lines represent median, 25% and 75% quartiles of past SSB, respectively. The solid black line is the average of 10 lowest estimated historical female SSB values, i.e., the SSB-ATHL threshold. Outlier values are not shown in these figures. The ISC concludes that the north Pacific albacore stock is healthy (SSB2012 > 20%SSBcurrent F=0) and that current productivity (SSB2012) is sufficient to sustain recent exploitation (F2010-2012), assuming average historical recruitment (about 42.8 million fish annually) continues.